The lack of posts has been a really good indicator of the amount of free time I've had in the past week or two. Lots of extra shifts at work, time in the hospital, and trainings at various work locations. I have the next few hours all to myself, after having slept until 1 pm this afternoon. I did my first night shift at the hospital last night! Despite being terrified that I would pass out from exhaustion in a hallway somewhere, I was surprisingly awake for the better part of the 12 hours. I did get about an hour, maybe an hour and a half of shut eye during my breaks but I didn't fall fast asleep at any point in time. And what really shocked me was that I left the hospital this morning kind of enjoying working nights. The night shift is still busy but it's also much quieter. Between taking vitals every hour and making sure the patient hadn't pulled his ventilation tube off of his trache (three times, each time I panicked because I thought he was choking to death and the machine's alarm didn't help ease my anxiety), I found time to read through 2 nursing articles and even time to browse through a healthy living/organic style magazine. I gave my first injection of the year (16th ever and no nervous hand shaking! ), gave meds through a PEG tube again, set up feeds, and just about scrubbed my hands raw as the patient had MRSA. I also narrowly missed my first death on the unit. When I returned from break I learned from one of the other nurses that a woman had come up from another unit and within an hour had gone into cardiac arrest. They tried CPR but she had died. As she told me, I looked over my shoulder towards the area where the woman had died just in time to see her being covered and wheeled off of the unit. Sort of a weird feeling at 3 am. But all in all it was a wonderful first evening shift and I'm almost looking forward to the next one. One of the nurses lives in the building beside me so she picked me up on my walk to the hospital and drove me home in the morning! So obviously I'm deciding what gift I'll give her at the end of the semester. The LCBO goLOCAL blog challenge is almost over as voting ends tomorrow and then it'll be a waiting game to see if I got enough votes to put me in the top 5. My friends and family have been incredibly supportive and I want to thank everyone who has voted for doing so! Lastly, one of my friends (after helping me solicit votes) said that she had recently found this blog and enjoyed the bacon wrapped asparagus post. So to thank her for helping me with the voting process I give you another amazing bacon recipe - one that I have yet to try but I've been thinking about this one on and off for about 4 years. 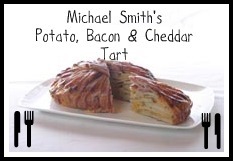 The recipe is from Michael Smith (Chef at Home). Carefully arrange the bacon in a radial pattern from the centre of the bottom of a 10- or 12-inch (25 or 30 cm) round non-stick baking pan to the lower edge of the rim and continuing up and over the sides of it. Let the ends hang over. The slices should overlap slightly around the sides of the pan. To reduce the thickness of the bacon in the centre, stagger every other piece, starting it 2 inches (5 cm) from the centre and extending it further than the adjacent slices. With the palm of your hand, flatten the centre area, leaving no gaps in the bacon. Season the bacon with lots of pepper and then sprinkle on several spoonfuls of the shredded cheddar. Slice the potatoes as thinly and uniformly as you can, about 1/4 inch (6 mm) thick. Arrange a circular pattern of overlapping slices around the inside bottom edge of the pan. Continue arranging overlapping layers of the potatoes until the bottom is evenly covered. Season the potatoes with salt and pepper. Mix together the onion and garlic and sprinkle some of the mixture onto the potatoes. Continue with a layer of the shredded cheese. Cover with another layer of the potato, pressing it down firmly before continuing with alternate layers of the potatoes, onion mixture and cheese, insetting each a bit from the edge of the pan until the top is an inch (2.5 cm) or so higher than the pan’s rim. Fold the overhanging bacon neatly up and over the top of the potatoes. Trim a small piece of parchment paper and place it in between an ovenproof lid and the bacon. This will prevent the bacons ends from pulling back and shrinking during cooking. Place the pan on a baking sheet and bake for at least 2 1/2 to 3 hours. You’ll know it’s done when a small, thin bladed knife inserts easily. Pour off as much of the fat around the edges as possible. Let the tart stand for 15 minutes and then invert it onto a cutting surface. Slice into wedges and serve immediately. You may refrigerate any leftovers and reheat them later it in a microwave. I'm going to finish off this pot of coffee then print out some more nursing articles before I head to work.